Well, Ladies.....as your emails have proven over the past 5 years, everyone has a different experience while dancing through yet another phase of hormonal changes. With the range of ages and symptoms, it's really tough to come up with a "group" solution, but we've certainly become more knowledgeable with the help of the internet where women are sharing their individual stories. This has helped more than all the medical studies/articles/reviews put together! We now have more control over our health and more confidence to trust our intuition. Whether it's surgical menopause or natural menopause, it's going to happen at some point to every woman, but like snowflakes, no two experiences are exactly the same. All of the things we've read and heard are real and have to be dealt with on an individual basis, but as a group, we can all help each other by sharing. One of the first steps is awareness and recognition of the symptoms, then education and understanding of what is a natural progression of life, then experimentation and acceptance with the goal being to find a sense of balance...it's not easy, but it's not the end of the world either. In fact, it can be quite rewarding once you've come through what some women consider the most trying time of their lives.....literally, *hell*. Keeping the "rewards" in mind, this is why it's important to seek out those who have gone through it. 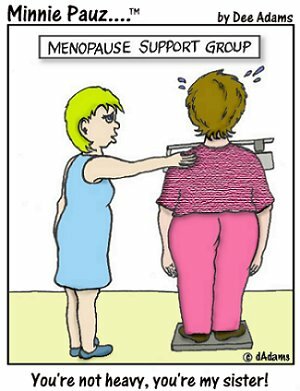 Reading books and other writings by wise women has been very helpful to me in my "Passage", and for the past 6 years, I've tried to be a resource for women dealing with not only menopause, but just middle age issues in general. My salvation has been humor so this has been my "vehicle" on this journey. I truly believe that "laughter IS the best medicine" and that humor heals. I hope you will take a look at what I've put together and find some comfort in the fact that you are not alone in your quest for that balance I mentioned.